TP: I'd like to ask you about the genesis of the Roscoe Mitchell Chamber Ensemble. You and Tom Buckner have been at least recording together since the late 1970's, and you've known each other now for at least 30 years, I gather. RM: Yes, that's true. We met in California in the late '60s. That's when we first met. We started performing together when we put our group together, Space, with Gerald Oshita. TP: Tom Buckner was up here a few days ago, and described hearing the Roscoe Mitchell Quartet, I believe it was, several times in the Bay Area in the mid 1960s. What were your first impressions of Tom Buckner? What was he into at the time you were out there? RM: Well, let's just say that when this group came together, I was putting focus on composition and improvisation. And Thomas Buckner interested me because he was an improviser when I met him. I don't know if you recall any of his earlier recordings with Ghost Opera, but it was a group that was from the West Coast that used improvisation in their music. I first met Gerald Oshita when I was in California in 1967. He was playing in a group with Oliver Johnson and Donald Raphael Garrett. All of these people were improvisers at that time, and this group came together to study improvisation and composition as they relate to each other, and that tradition continues today. TP: When did Joseph Kubera and Vartan Manoogian start to enter the picture? RM: Well, Vartan I met at a concert of Joan Wildman at the University of Wisconsin. We were playing together on a composition by Joan Wildman. I think we struck a chord from that very beginning, and we decided that we would go on and try to do some work together. I think our first performance was on a concert of Vartan's at the Eldon(?) Museum in Madison, where we performed the composition, the duet for alto saxophone and violin entitled "Night Star." TP: You've been involved in maybe four or five simultaneous ongoing projects over the last number of years, it would seem to me. This ensemble with Joseph Kubera, Vartan Manoogian and Thomas Bucker, that's performing Thursday; the Art Ensemble of Chicago, which has been a primary interest for a quarter- century and more; the Sound Ensemble; the Note Factory. Are compositions written or structured for specific musical units, or are they mutable, adaptable to different performance situations? RM: Well, certainly you can transpose a composition so that it will fit, you know, any situation you want it to fit. Usually how I start off on a composition is first I have an idea, and then I figure out how to get that idea down. Then a lot of times you are given the size ensemble that will perform the work that you're writing. So it's determined by lots of things. One composition, "Nonaah," started off as a solo piece, and has ended up being played by larger ensembles, quartets, trios, so on and so forth. TP: We could probably do a nice 90-minute presentation on various examples of how "Nonaah" has been formulated. RM: Yeah, people have done that. There's a young woman in Madison, whose name slips my mind right now, who did her dissertation on that piece, along with some works by Cecil Taylor and Albert Ayler, I believe. TP: When was "Nonaah" actually written or conceived? RM: In the early '70s, as a solo piece, like I said. TP: Putting together a solo piece, does it come from your explorations of the instrument? Does it come from a more conceptual framework . . . ? RM: Well, let's look at it. One part of "Nonaah" is set up so that it has wide intervals. One of the thoughts that I had when I was composing it, I wanted to have a piece that was played as a solo instrument that would give the illusion of being two instruments, and with the wide intervals like that, you can get that, because the instrument sounds different in the lower range and the mid range and the high range, and then there's also the altissimo range, of course, which sounds different from any of those other registers. So if you construct a melody that moves in that way, in taking advantage of the intervals, then you will achieve that goal at the end. And that was one of the thoughts that I had when I was constructing the composition. But then, of course, after that, you use that same basic formula to structure other movements of the piece. So for me, I guess, I am at the point now where if I needed to do anything in that particular system of music, I could do it, I feel like I could do it, because I have built the vocabulary related to that structure. TP: I saw the Art Ensemble of Chicago perform in Chicago on December 1, and you were performing on soprano, alto, tenor sax, and you had the bass saxophone as well, although I don't think you got to play it . . .
RM: No, I didn't play it, actually. I just brought it along, because it was going off to Jamaica where we're going to be for the next month, and I guess I just kind of forgot to play it. I mean, a lot of times I don't really get to instruments, but I like to have them there if I'm moving in that direction. TP: What determines which instruments you're playing at a particular time? Your main concentration over the last number of years seems to be with the soprano and the alto saxophone. It doesn't seem like we get to hear you always on the tenor, but when we do, it seems like you've really been putting a lot of work or thought into a particular area. Has that been happening lately? RM: Well, I mean, what determines what sounds I get to is, like, a lot of times I'm trying to just move different sounds around, and then whatever I hear that can add on to the structure I'm working on, I'll select the instrument based on that. So this is how these things get determined. Unless, of course, there's a specific composition which calls for a specific instrument. Then that would be played on that instrument. TP: How long has multi-instrumentalism as a way of getting to the plethora of sounds that are at your disposal been a major preoccupation of yours? Did that begin with your exposure to the AACM and that group of musicians? RM: Well, I think that, like, in the late '60s I wanted to explore other sounds. But then, if you notice, in the history of the music, before the bebop era, in the larger bands, a lot of the woodwind players doubled. RM: Yeah. If you see some of those pictures, they had quite a variety of instruments that they played. I think the music at some point moved to where it was a one person, one instrument type focus. TP: With smaller combos, sure. I mean, Harry Carney played baritone sax, bass clarinet and clarinet, and Jimmy Hamilton . . .
RM: And so on, yeah, sure. TP: But in terms of your preoccupation, you weren't really coming up in Chicago in an environment where that sort of multi-instrument was a common thing as such. RM: That's true. But I think my fascination with sounds drew me toward that. For instance, the Art Ensemble is an outgrowth of a quartet of myself and Malachi Favors and Philip Wilson and Lester Bowie. When Philip left the group, we were drawn more to percussion sounds. That was because we didn't really have anyone that we thought could come into the group and function in his place in terms of the type of melodic structure that he dealt with. So that drew us more into percussion. It just kind of added on to my fascination with the exploration of sounds. I mean, sometimes I don't really hear like a scale per se. I might hear one note, and then the next note with a whistle, or a whistle with kind of a wind instrument, or a whistle and a bell. There are so many different possibilities to explore. TP: When did your obsession with the saxophone begin? When did it become evident to you that music was going to be your life? RM: Well, I guess I kind of knew that in high school. And I was fortunate enough . . . If you remember the record Hey, Donald!, that's dedicated to my friend Donald Myrick, who went on to help establish Earth, Wind and Fire. Donald Myrick was an excellent musician when I met him in Chicago, and he was a big motivation for me -- you know, to see someone, one of my peers actually doing that. So I guess I kind of knew it then. And I had an older brother who had many, many 78 records, and he would get me to sit down and listen to them, and that really . . .
TP: What kind of records were they? RM: Oh, you know, all of the old ones -- J.J. Johnson, Charlie Parker. Everything was on 78 then. Billie Holiday . . .
TP: In the late 1940s, early 1950s? TP: Who were the people who really caught your ear first as far as stylists, specifically as saxophone stylists? RM: That's hard to say, because I liked different stylists from different records. If I were to look at the tenor saxophone, I'd look at like our history of many styles. And this is how the tenor is represented in my mind. And then I always listened to, you know, the same music that my mother and father listened to. So it was a wide variety of music. TP: What were they listening to? RM: Oh, everybody listened to everything that was popular then. It could be a popular song or . . . Oh, and it was always on the jukeboxes, too. The jukeboxes actually had a variety of things that you could select from. For instance, when James Moody's "It Might As Well Be Spring" was popular, everybody listened to that, not just a select group of people from here or a select group of people from there. Everybody knew about that. Everyone knew of that duet with Ella Fitzgerald and Joe Williams. You know, whatever, whether it was a song by Nat "King" Cole, or even when Johnnie Ray had his hit, "Cry." All of these different things were common knowledge. So for me, I had a wide variety of music to select from. TP: Did your choice to pick up a saxophone at an early age . . . How old were you when you first began playing? RM: Oh, I was a late starter on saxophone. I mean, I started clarinet first when I was 11 years old. That's late-starting. TP: How was that inspired? Through your family or through school? RM: I guess mostly through my older brother, Norman. I was always interested in music, and I used to sing a lot when I was younger. But I guess mostly influenced by him to want to go on and actually pursue an instrument. TP: What was your first more or less formal instruction? Was that in high school or in the elementary schools? RM: That was in high school. RM: I started clarinet in Milwaukee, at I think it was West Division High School. I don't remember the teacher. TP: Did you further that in high school in Chicago? RM: Yes, at Englewood High School. TP: Did Muhal Richard Abrams go to Englewood as well? RM: I don't believe so. I didn't know Muhal then. TP: I'm sorry to keep putting you all the way back in the '50s, but there are some things I've been curious about for a long time, so I'm taking the opportunity. Were you playing in a lot of teenage combo situations, gigs for money and so forth then, in high school . . . ? RM: Well, no, not that much. I mean, we had our regular obligations that we did in high school, with the concert band, and I was also a member of the dance band. I think that I started to function probably more as a professional musician when I was in the Army, from 1958, I believe it was, to 1961. So by the time I got out of the Army, it was pretty much solidified that I was going to be a musician. TP: I gather that the Army was a real mind-bending experience for you musically, and you were exposed to many different ways of playing music. I think one account I've read has you encountering Albert Ayler in Germany in the early '60s. RM: That was a big influence on me. Because at that time, I was aware of Ornette Coleman's music, but I have to say, even as a musician at that time, I didn't fully understand what Ornette was doing. The thing about Albert Ayler, when I first met him, one thing I knew about him, I knew basically what was happening with the saxophone, and I knew he had a tremendous sound on the instrument, and that lured me in to want to try to figure out what it is that he was doing on the saxophone. I remember once there was a session. They were all playing the blues, and Albert Ayler, he played the blues straight, like for two or three choruses, and then started to stretch it out. And that really helped me. That was kind of a major mark for me musically, just to be able to see that that could really be done. TP: Again, referring to interviews, you've described being impressed at that time by Sonny Rollins, by Hank Mobley, by Wayne Shorter -- I think those are the three names that come to mind in terms of playing in a style. Were you playing tenor, alto . . . ? RM: I was playing alto. I mean, in the dance bands I played baritone. TP: So the multi-instrumentalism started there. RM: Well, you could say so. I mean, my first encounter with the saxophone was baritone in high school. The guy who was playing baritone in the dance band graduated, and I was moved up to that position of playing the baritone. But I think the alto was the saxophone that really caught my interest. TP: Describe the ambiance of being in an Army band in Germany, in 1959, 1960, 1961. The regimen, the musicians, and the off-base scene that was happening in Europe at that time. RM: Well, that was a really good time to be where I was in Germany. I was in Heidelberg, Germany, which is the place of the famous Cave 54. Now, that was a club where most of the local musicians would play in, and everybody that was coming from out of town would play there. There were a lot of sessions there. Some of the people that you'll know now were there. Karl Berger was there, Albert Mangelsdorff was there, Bent Jadik (who when I was in Denmark at this time I didn't see him, but I was talking to the guy at the music store, and I asked about him, and he said he was still around). Many things happened there. Then Nathaniel Davis stayed in our barracks. He was in a quartet that won the All-Army competition, and they stayed with us for a while, and they were going around Europe playing. And then names that you don't know. Joseph Stevenson, who was a sergeant, who now I've heard is a warrant officer, was a great musician, an alto saxophonist and composer. Many, many people. William Romero. Just a lot of people that made influences on me. I mean, there was a guy there, Sergeant Mitchell. Palmer Jenkins, a tenor saxophonist. So there was a lot of music and a lot of opportunity to learn. TP: I gather in the Art Ensemble, you, Joseph Jarman, Malachi Favors and Lester Bowie, all had Army experience. Lester has stated that that experience helped you survive as a unit on your travels and travails particularly in Europe in the late '60s and early '70s, and in the years before that in the States. RM: Well, that's very true. I mean, no one has ever done anything for us. We've always done everything for ourselves, in a way, so far as the Art Ensemble is concerned. I don't think the Art Ensemble gets any recognition now. And we're still going on, and still doing concerts, and still filling houses, and everybody tries to act like we're not doing that. So yeah, I guess our Army training did help us get to this point. TP: A lot of discipline entailed that I'm sure was retained and is retained in the way the Art Ensemble functions. TP: When you got back to Chicago after the Army, what sort of scene did you find? RM: Well, that was when Muhal had the Experimental Band there . . .
TP: '62, we're talking about? RM: '61. In '61 Muhal Richard Abrams had the Experimental Band. It met once a week, and it was a great opportunity to go down and meet all these great musicians, and get a chance to really be in a big band that was rehearsing. This year at the Chicago Jazz Fest Muhal put together that band as closely as he could for a performance there. It would be great to do more things with that band. After I had been in Israel and heard everybody sounding the same, and then got back and I was in a band where everybody sounded like themselves, it was a very interesting phenomenon. TP: You're talking now about 1961. RM: I'm talking about Muhal's big band. Everybody in there sounds like themselves. They don't sound like anybody else. They all have distinguishable sounds, their ways of phrasing, their different ideas about music . . . I think this is one of the things that stimulated me over the years, to be fortunate enough to be associated with people like that. So that was a great experience. That band was rehearsing every Monday night, and i would have to say that that band was the place where started the thought, you know, of the AACM -- to actually put together an organization that would function in promoting its members and concerts of their own original music and maintain an educational program for younger, inspired musicians. These things we carried on from there, as you know. Like, when the Art Ensemble went to Paris and we carried the banner of the AACM. TP: At that time also you encountered a number of musicians with whom the relationships have maintained for three decades and more. Malachi Favors at Wilson Junior College at the time, Jarman, I think Henry Threadgill was around then . . .
RM: Threadgill. Jack DeJohnette was there. TP: Braxton before he went in the Army. TP: And Jack DeJohnette at that time I gather had a piano trio with Steve McCall on the drums. RM: Yeah, he did. But he was starting to play drums then. Because he and I used to play drums and saxophone all the time. TP: So was there a lot of interplay and experimentation and workshopping amongst you, working with different ideas and so forth? RM: Well, you could say that Muhal's place was like the meeting place for people. We'd kind of all show up over there, and then Muhal would be bothered with us, you know, for that whole week, and still come to the rehearsal on Monday with a composition for the big band. Amazing. TP: So Muhal's place was really sort of the clearing house where all these ideas could come together and be formulated. RM: That's right. And we studied music, art, poetry, whatever. It was like a school. It was a school. TP: Talk a little bit about how your first band that recorded, which recording I believe will be issued for the first time on Nessa . . . A 1964 recording which I think you mentioned last time . . .
RM: Yeah, I did mention that. I still don't have a release date on that record. That was an early quartet with Alvin Fielder, Fred Berry, Malachi Favors and myself. TP: Was that quartet performing all original music by you, or was it a more collectively oriented thing? RM: The music was mostly by me. I remember on that one tape there's a piece by Fred Berry also. TP: Are there any pieces that you wrote at that time that you still perform to this day, that have lasted? RM: Oh, certainly. There's many. We still perform "Ornette." I still perform "Mister Freddie," which was recorded on a recent Jodie Christian disk. We intend to perform "Sound" again. To me, any music that you do is just a kind of work in progress, so to speak. So you can at any time go back to that work and extend it or . . . As for me, I mean, some things that I did with "Sound," for instance, become more interesting to me now that I could apply maybe circular breathing to those situations, and do something, I don't want to say more, but do something different with it in the way of expanding it. So to me, it's a work in progress. TP: The Art Ensemble's Friday night Chicago concert concluded with Malachi Favors' "Magg Zelma," but before that you performed "Ornette," if I'm not mistaken. RM: "Mister Freddie," I think it was. TP: At any rate, I've given Roscoe Mitchell the third degree now for about half an hour, so we'll give him a break right now and play some music. RM: I thought it was a talk show! TP: Well, it could go any direction. [Music: Pilgrimage, "He Didn't Give Up; He Was Taken" (1994); R. Mitchell Quartet, "Hey, Donald!," "The El" (1994); Art Ensemble of Chicago, "The Alternate Express" (1990). TP: Does the New Chamber Ensemble frequently perform? RM: Yes. We have been performing. Like I said, it was an outgrowth of the group Space. TP: Recently are there many opportunities to work? RM: We have more opportunities coming up this year than we had last year to do things. However, within the Chamber Orchestra work that I premiered in New York last June, Thomas Buckner was the baritone singer. I think we also did a piece with Thomas Buckner and Joseph Kubera at that time. But no, the group doesn't work as much as I would like to see it work. But there are starting to be more opportunities. 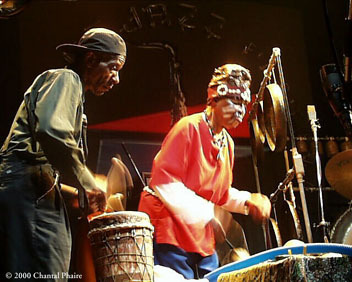 TP: The Art Ensemble has been very busy lately. I was told that you'd been on the road for maybe five-six weeks, and there were 35 to 40 performances prior to your Friday appearance in Chicago. RM: That's true. We were on tour the last couple of months. Now we're going to go down to Jamaica because we're going to be doing a recording, and also music for commercials, for this juice company known as Odwalla. I don't know if you keep up with different companies. But "Odwalla" is also the name of a song that I wrote. TP: A theme song for the Art Ensemble. RM: That's true. They've been an ongoing company that's followed our career, and they've always been interested in our music, so now we're going to do a recording that will be sold at their outlets for their juice. They've also become involved in this water that comes from Idaho, from these people called the Underground Water people. I believe the water is 16,000 years old, and now it's starting to come back up through the ground, and it's been rated as some of the best water. Certainly the company has been rated as having some of the best juice. They've had write-ups saying that they are one of the most environmentally friendly companies that's out there right now. Not to mention that their juice is very delicious. So we're going to be there doing a record, and doing some music for commercials and things that they are going to start to have. TP: Have you been writing new music specifically for this project with the Art Ensemble? RM: Yes, we have, and we're going to be writing more. It will incorporate some different things. We'll have Jamaican musicians on there, and voices, and different things. That's what we're going to be doing down there. TP: Multiple recordings, or just one? RM: Well, that's not totally decided. That remains to be discovered. TP: The next set of music focuses on Roscoe Mitchell with some musicians who played a very important role in his music of the 1980s, Detroit-based Jaribu Shahid and Tani Tabbal, Hugh Ragin was part of some of your quintet music, and Michael Mossman is another trumpeter who was involved with you. I'd like to talk about that aspect of your music-making in the 1980s with Michigan- and Wisconsin-based musicians. RM: If you look at Michigan, there we had the CAC, which is the Creative Arts Collective, which is a group that followed the same basic fundamentals as the AACM in its structure. It was a group of musicians that came together; you know, we did our own concerts, we had our small groups and things inside of that larger group and we had concerts for them. We also brought in musicians from Chicago and New York to do concerts. We had the help of the Abrams Planetarium on the Michigan State University campus; they let us use their hall for concerts . . .
TP: This was in the '60s, the '70s . . . ? RM: It must have been in the '70s. In the '70s it was, yes. So this is another ongoing work in progress, my work with the Detroit musicians. TP: Do you recollect your earlier meetings with Jaribu Shahid and Tani Tabbal? RM: I was living in Michigan at that time, and that's where we met. Jaribu Shahid and Tani Tabbal weren't there at that time. It was Spencer Barefield, one of the musicians who I saw the other night at the AACM 30th Anniversary, Dushan Moseley was there, and other Michigan musicians, William Townley . . . Guys who . . . we had put together an organization that, like I was saying, was similar in philosophy to the AACM -- for that purpose. TP: I guess interplay between the AACM and the Detroit-based musicians goes back to concert exchanges in the 1960s, when Chicago musicians would go to Detroit to present concerts and vice-versa. RM: That's true, but that was largely due to John Sinclair, who at that time was the leader of the Detroit . . . God, what was it . . . It wasn't the White Panther Party then. It was another name. Then he went on to be the leader of the Rainbow People in Ann Arbor. But they had their own newspaper in there, and they had like maybe a whole city block there, where they had places for performances, for musicians or artists to come and be involved in the program that they had there. TP: This group developed in some very interesting ways, and I guess was the kernel for several offshoot groups -- the Note Ensemble and various editions of the Roscoe Mitchell Sound Ensemble. I'll repeat a question I asked earlier: In working with these particular groups, what are the dynamics of each of them that impact your writing or arranging or structuring of sound for either the musicians or the overall ensemble? RM: Well, I mean, I'm hearing different things for different situations. Like you said, those groups can be broken down, because I've worked with different varieties of those groups. But the Note Factory is getting closer to I guess this grand sound that I'm hearing. That's why we have like the two basses and the two drums and piano and myself as the bare bones of it. Eventually we'd probably like to have two pianos, and then I've thought of a couple of other horn players to go with that sound -- it would probably be Hugh Ragin and George Lewis. TP: You recently were on a record of George Lewis, in acoustic duos and interactions with the Voyager computer program. RM: That's true. We also did a concert at IRCAM this last summer in June, which was a concert at IRCAM for the Voyager program. TP: Our thanks to Roscoe Mitchell. One final question about solo performance. Your solo work on record goes back to the 1960s, and continues to this day, I gather, with some frequency. RM: Yes, that's true. I've always been interested in solo playing as one of the options. TP: What are the dynamics of solo playing that are particularly appealing to you? RM: Well, one thing I can say about solo playing, if you're listening to me, and I sound like an orchestra and not a saxophone, then I'm successful to some degree. When you're playing with someone else, I guess you can always blame them for messing up. But if you're playing with yourself, then you have to blame your own self. So it's a challenge, of course . . . Well, it's a challenge playing with someone else, too. So to me, I just see it as one of the parts that make up the whole picture. TP: Is there a process of trying to transcend the saxophone, whatever limitations there are in performing it? RM: Well, I think everybody does that when they are really successful at whatever it is that they are doing. You actually do transform the instrument that you're playing. I mean, the instrument is just the vehicle by which you are able to transmit the sounds.